November 8, 2016. Election Day. I will not discuss politics except to say that this blog post was inspired by all of the craziness this election has stirred up. 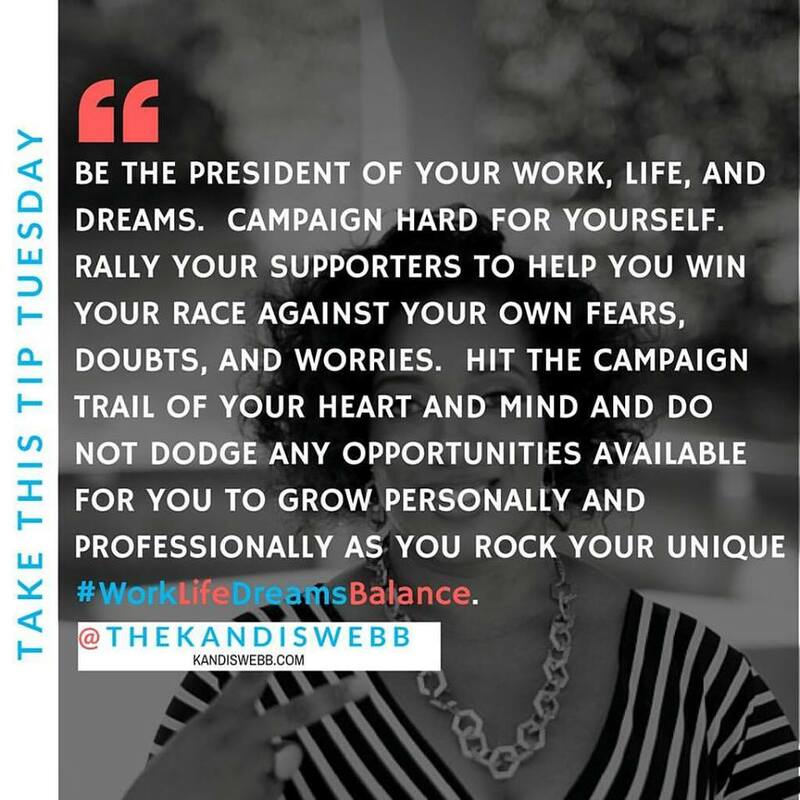 Every Tuesday is #TakeThisTipTuesday in my world and I try to provoke your mind, your beliefs about yourself, and inspire you to move closer towards your goals, dreams, and desires both personally and professionally. “If you defended yourself, your goals, your dreams, and your desires as hard as you do your pick for president….where would you be? If you worried about your own brand and marketing (resume, portfolio, LinkedIn, and job performance) as much as you do the candidates’, then where would you be? Tons of energy was given to this election from the citizens of the good ol’ United States of America and from the candidates. Hillary Clinton and Donald Trump both campaigned tirelessly to gain the hearts and votes of the American people. Why don’t people channel all of that energy into their own goals? Why don’t people use all of that energy to be the president of their united work, life, and dreams? We could all learn a lot from this election. Here are 5 lessons I wanted to write about today because they’re relevant to the people I usually work with – hard-working employees looking to align their job with their life goals and dreams. 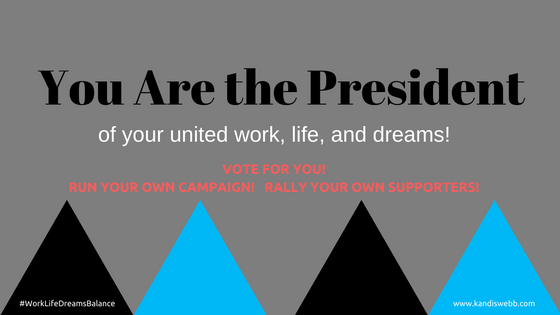 You are worthy of being more fired up and passionate about yourself than you are about your pick for president! (click to tweet) If you’re not as passionate about your own goals, dreams, and desires as you are about your pick for president, then you need to focus more on you and less on them. They are living their life. Achieving their dreams. Making history. Are you as passionate about your goals to do the same? Nobody is perfect! Don’t get so caught up in your looks, old voice recordings, past faults, regrets, and failures that you sit out the big race(s) of your life. If either of these two candidates had done that, we wouldn’t be voting for them today. Stay present to who you believe yourself to be RIGHT NOW…TODAY…and walk proudly in that. Don’t judge yourself. Everyone will judge you enough. Just show up as YOU and I promise there will be people who truly love you and want to see you win! Be prepared for the bullcrap. It’s inevitable. There will always be haters, obstacles, debates, and negative chatter in your head. If you’re prepared for it, then you can handle it (Like Oliva Pope) when it comes. Be so sure and positive that about yourself and your goals that any negativity will not be enough to cancel you out. Nobody cares about all the little tasks you’ve completed. They care about the results of your work. What you’re consistently known for doing. As you continue to work towards your personal and professional goals, make sure you’re able to sell yourself and the value you bring. What relevant successes should people care about when you’re asking them for a job or a promotion or to be your client? Know your worth! Know what you bring to the table. I talk about this often with my resume service. Ultimately, you should be doing all you can do govern yourself to the best of your ability. You should be doing everything you can to ensure your own life, liberty, and pursuit of happiness is not being hindered or destroyed. I voted for my pick, but I’m always going to be voting for ME and trusting ME to rock my work, life, and dreams. If you don’t believe you’re doing that yourself right now, check out my free WORK-LIFE-DREAMS BALANCE KIT. It’s 3 downloadable PDFs that include a goal planner (including a dream team building section), self-work workbook (to prepare for the bullcrap), and a gratitude journal (to stay focused on all the great things and resources you do have).